For photographs of finished miniatures, please check out our Ork, Speed Freeks, Feral Orks and Grots galleries in our Warhammer 40K Galleries. These conversions are as follows. The left model has a Big Shoota from a Warbike. 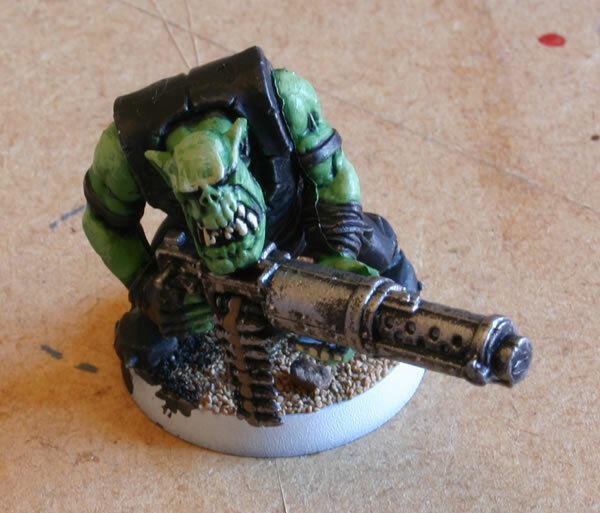 The middle Ork has had his Shoota extended to make a Big Shoota. The Ork on the right has had a Rokkit Launcha using a grenade and Shoota, see this workbench feature on how I painted a similar model. I start off with a black undercoat and then do all the metallic bitz with a drybrush of tin bitz and chainmail. I then do all the Ork skin with a dark green, usually Snot Green. The next stage is to highlight with Goblin Green before doing final highlights with a mixture of Goblin Green and Bleached Bone. 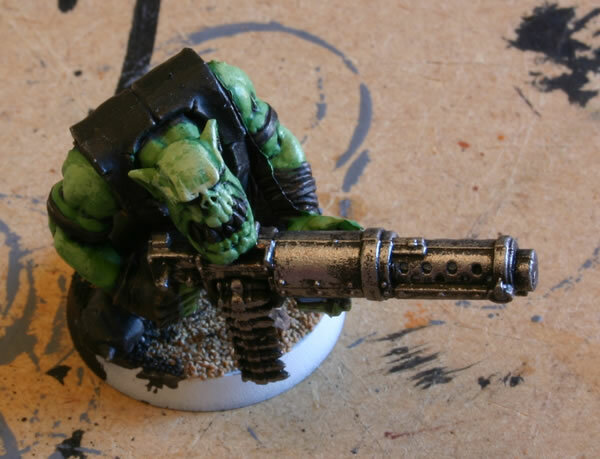 This is one of my conversions, an Ork with a Big Shoota. 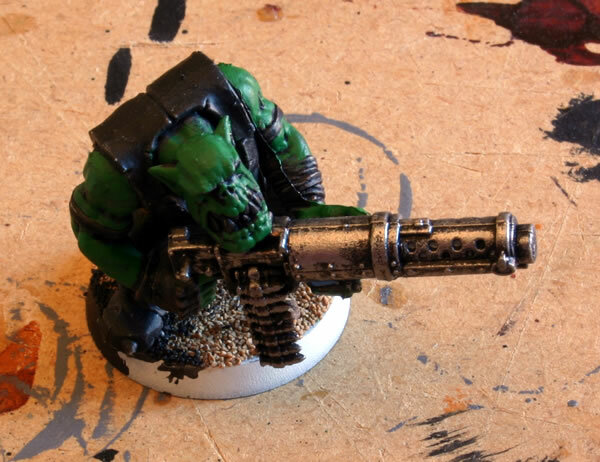 The Ork has had his Shoota extended with barrel of another Shoota to make a Big Shoota. I started off with a black undercoat and then do all the metallic bitz with a drybrush of tin bitz and chainmail. I then do all the Ork skin with a dark green, usually Snot Green. I then highlighted with Goblin Green before doing final highlights with a mixture of Goblin Green and Bleached Bone. I then did the teeth with Bleached Bone and the ammo belt. Copyright ©1998-2015 Felix's Gaming Pages All Rights Reserved.